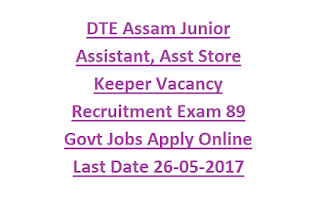 qualified Degree and having Computer Skills of Data Proficiency then can submit their applications for this Junior Assistant and Asst Store Keeper Jobs through official website of DTE Assam @www.dteassam.in. Online applications links will be active from 05-05-2017 and will be disabled on 26-05-2017. 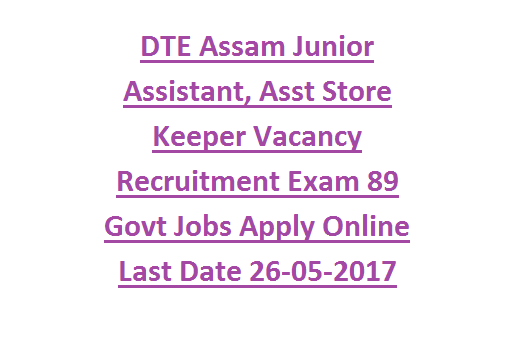 Selection for this DTE Assam Junior Assistant, Store Keeper Jobs will be through written exam and Computer Proficiency Test. For information related to this DTE Assam Junior Assistant Jobs vacancy exam pattern, selection process, qualifications, age limits and more details briefly given below. For both the posts Candidate must have qualified Degree from any recognized university and should have knowledge in Computer Proficiency, Data handling and Typing on Computer. As on 01-01-2017 age limits for Junior Assistant Jobs is 18-38 Years and for SC/ST candidates age limits are applicable as per the Assam State Govt Norms. Application fee is Rs. 250/- for General candidates and Rs.150 for SC/ST/PWD candidates. Selection for both the posts will be based on Written Exam and Computer Proficiency Test. Exam Pattern and Syllabus, Computer Proficiency Test details will be uploaded in official website of www.dteassam.in. Interested candidates can submit their application form online through official website of www.dteassam.in. Last date for online application submission is 26-05-2017. Only online applications are accepted no other mode will not be accepted.